The H804-6 Forbes Company set is part of the baseball comic series of trade cards. 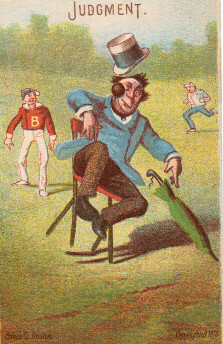 The cards feature a variety of humorous baseball scenes depicting baseball players in a variety of situations. Of note is that most of the faces of the players have unusual looks and their bodies are oddly shaped and mostly lanky. The cards have very brief titles, using only a single word or a two-word phrase to describe the picture. In addition to a caption at the top, the cards also have the copyrighted date of 1878 in small print at the bottom as well as the words “Forbes Co. Boston.” Printed in 1878, these are among the oldest trade cards. As is the case with most trade cards, these are fragile and printed on thinner card stock. For that reason, they can be torn or ripped quite easily and damaged easier than standard baseball cards. Many trade cards were used by numerous companies. That is in part because it was easier to use artwork that was already produced rather than going through the trouble of creating your own. For that reason, the bottoms of the cards can be blank or include an advertisement for different companies. A few different variations of these cards are known, though ‘variation’ may not be the correct word. Standard cards typically have the title printed at the top and a printed/stamped company name at the bottom. A second type has the title of the card at the top but no advertiser sponsor/name on the bottom or the reverse. These were cards that would have been awaiting a business name to be added. Cards with this sort of missing characteristic are usually called Stock Cards. The third type of these cards is sometimes considered a proof of a sort. But that might not be entirely accurate. These have the same images but are missing captions at the top, the copyright date, and the ‘Forbes Co. Boston’ print at the bottom. They aren’t really stock cards like the second type mentioned above since stock cards would have had the caption at the top and would be ready to be distributed, only missing only a company name. The fourth type includes a business or company stamp but no caption at the top. Why those would have been distributed to companies to have their names added remains a mystery. Presumably, companies would not have had the opportunity to add their own advertisement to cards until they had received the caption at the top. These cards are actually an indication that the third type of cards was not a proof at all and that some (many, even) were distributed intentionally without the caption.